FHU Series filter housings fit standard filter cartridges offered by major suppliers. They provide high-flow performance, and reliable sealing that can be tightened after initial compression loads. 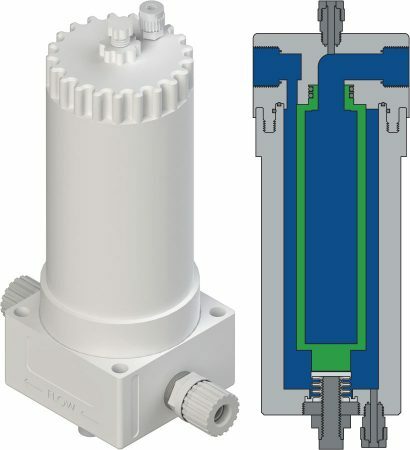 These PTFE and PFA housings are nonmetal and enable changing filters without disconnecting liquid lines. They are capable of up to 210°C (410°F) fluid temperatures. Two O-rings in an angled load system ensure reliable seals to prevent leaks. Sealing pressure can be adjusted beyond initial compression loads. They maintain pressure and prevent leaks, which improves reliability, and eliminates costly downtime and expensive cleanup.